1. What was the illustrious nickname Ian McEwan acquired in the 1970s? 2. In which unnamed city is The Comfort of Strangers set? 3. From which Jane Austen novel does Atonement take its epigraph? The first ten students who email the correct answers will be sent a copy of the guide. Please send an email with your answers to: ccoalter@continuumbooks.com and be sure to include your name, the name of your university and your preferred postal address. The competition ends when the tenth book has been given away. Good luck! 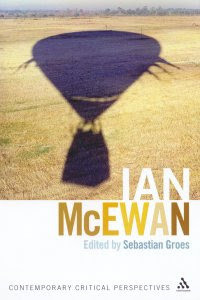 A valuable addition to McEwan scholarship, this collection of essays from the Contemporary Critical Perspectives series helps define and guide the future course of McEwan studies. Purchase online from Continuum, Amazon.co.uk, Amazon.com, BN.com, or a wide selection of high-quality Independent Booksellers. Includes a chronology, bibliography of further readings, and an index.